From the 22nd June 2016 you once again need an access key in order to use the google maps API. This is a return to the situation as it was before version 3 of Google Maps. However this change currently only applies to new web sites which is why I hadn’t noticed it up until now. Smap does not use the Google Maps API directly to draw maps, instead we use Openlayers and Mapbox, however we do use it to retrieve google street maps and google satellite base maps. If you have recently installed a new Smap server you may find these base maps no longer show up. The problem has been addressed in version 16.06.11 of the Smap Server which is available from the downloads page of the Smap website. This version has an extra tab on the users page labelled “Server”. You will need the “Organisational Administrator” role to see this tab. To get the google maps back you only need to set the google maps key. 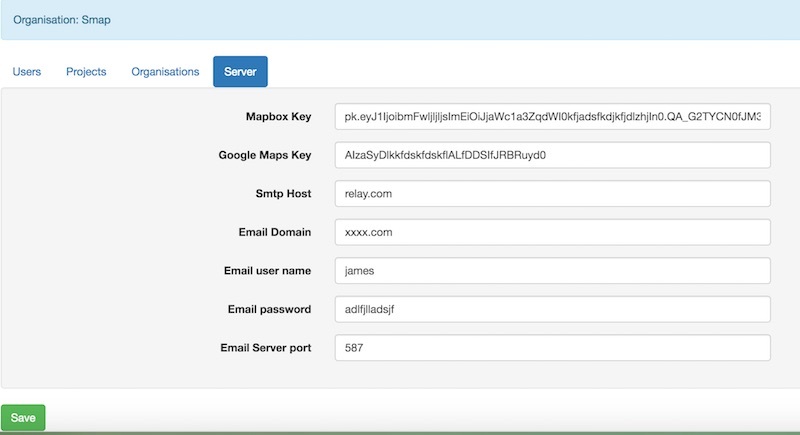 However you can also set the server level mapbox key and email configuration from this tab. This entry was posted in Uncategorized on July 7, 2016 by Neil Penman. Great top see this new version of SMAP and the updates also. I am in the process of developing another project and I hope to continue using SMAP.